SeaWorld Succeeds In Delaying Orca Welfare Bill "For Further Study"
Last month, we reported on a bill introduced to the California State Legislature by Assemblymember Richard Bloom, which would end killer whale performances in the state and begin to phase out their captivity more generally. Today, Bloom's office announced that the vote was delayed for further study. To recap: AB 2140, which is informally called the "California Captive Orca Welfare and Safety Act," would end "performance-based entertainment" for all 10 orcas in the state (7 of which were captive-born), end captive breeding programs for the species within the state, prevent the import and export of genetic materials, and prevent the import and export of the whales themselves. "The public support for ending orca captivity has been overwhelmingly positive. One petition gathered 1.2 million supporters and another petition received more than twenty-five thousand supporters," Bloom said in an official statement. "However, the issues are complex and the committee took the responsible approach to make sure we have the answers to all questions before we move forward. Moving this to an interim study will allow us to demonstrate that the science supports ending orca captivity and to clear up the gross misconceptions that have been thrown into the debate. I am confident that once the facts are thoroughly reviewed, legislation phasing out orca captivity will prevail." The bill was discussed in a two hour hearing in Sacramento, but a vote was delayed so that further research could be conducted by legislators. According to the bill's official analysis, supporters point out the scientific information documenting the damaging effects of captivity on orcas' physical health and psychological well-being. "Supporters assert the conclusion from decades of cumulative results of both captive and field studies is that cetaceans possess a level of intelligence, awareness, and psychological sensitivity that makes it unacceptable to continue to keep them in captivity if not necessary for their welfare, survival, or conservation." SeaWorld, on the other hand, naturally opposes the bill. They argue that their orca program contributes to public education and to scientific research, and they (accurately) point out that they haven't removed an orca from a wild population in 35 years, and they no longer separate calves from their mothers. In addition, they say that visitors to SeaWorld San Diego inject quite a bit of money into the local economy thanks to money spent at hotels, restaurants, and other small businesses. Indeed, SeaWorld San Diego visitors spend twice as much, on average, as other local tourists, according to the San Diego Tourism Authority, as reported by the LA Times. In his statement before the State Assembly's Committee on Water, Parks, and Wildlife, Bloom worked to clear up some misinformation that has been spread since his bill was first announced. I introduced AB 2140 in the California State Assembly to end captive breeding and prohibit the import or export of orcas in California. While the bill seeks to end "performance" as we commonly understand it, the bill would still permit the existing stock of orcas to be on public display – which due to the age of some of SeaWorld's orcas, would mean they will have orcas on display for at least another two decades. This is but one of many misconceptions about AB 2140. For example, the bill does not mandate the release of SeaWorld's orcas back into the wild. In fact, I am in complete agreement with SeaWorld that their orcas cannot be released into the wild. Regrettably, they do not possess the skills necessary for survival. 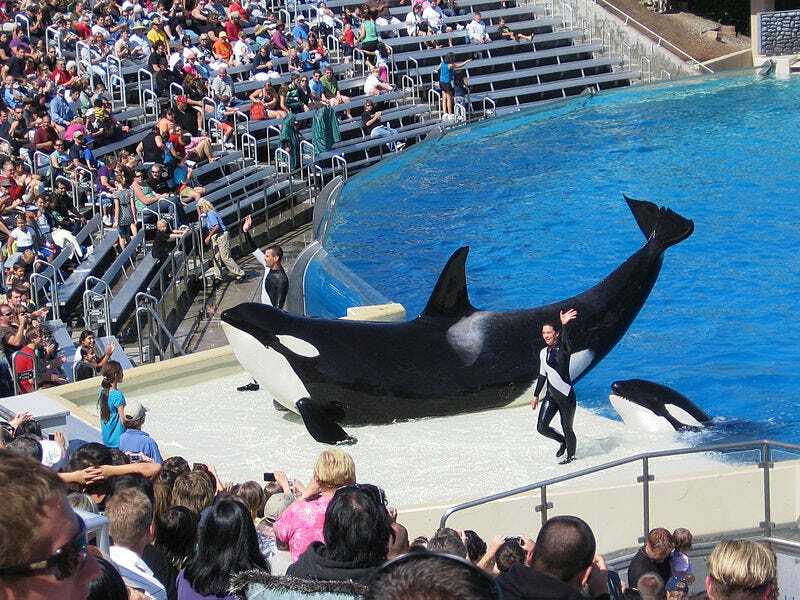 The bill does not prevent trainers from interacting with the orcas. Nor does the bill require the permanent separation of male and female orcas. The bill does not force SeaWorld to simply put their whales out to pasture, rather, it prevents them from continuing what many consider glorified circus acts. This may well be the most controversial aspect of my bill, for it must be acknowledged, these performances also attract audiences who are entranced by the orcas trained behaviors. But, there are alternative models out there such as the National Aquarium in Baltimore has done. They abandoned their dolphin shows for a more hands on and intimate program where visitors interact with the trainers and are able to get up close and personal to the dolphins. It is my understanding that this is also similar to a program at the Orlando SeaWorld – the Shamu Up Close program. Bloom also took care to acknowledge the good work that SeaWorld has done on rehabilitating injured marine life, and on funding and conducting wildlife and conservation research. He also acknowledged that SeaWorld San Diego would have to alter its business model, but points out that other parks have moved away from killer whale shows and have done just fine. Changes have already come to the world of the orcas. Right here in Vallejo, California the former Marine World Africa USA now Six Flags Discovery Kingdom, moved away from their killer whale shows, the park is doing just fine and weathered the recession without killer whales. Their doors are still open today. In her statement before the committee, Dr. Naomi Rose of the Animal Welfare Institute also acknowledged the value of having easy access to captive orcas for scientific research. This bill is not about ending research. The 10 whales in San Diego will be available for research for at least the next two or three decades. If anything, they will be more available for research, without having to perform on a rigid schedule of five shows a day every two hours. In addition, if they are retired to sea pens as the bill requires, they will behave more naturally and would be more useful as research subjects if the goal is to inform conservation of wild whales. As it is, research now done on captive whales is of limited utility to wild whales, given that captive orcas are in many ways abnormal, behaviorally and physiologically. Certainly research that improves husbandry or captive veterinary care is important while there are captive whales, but once the last captive whale is gone, this kind of research becomes unnecessary. The LA Times reports, "SeaWorld officials told the committee that the bill would cripple the park's program of rescuing injured animals in the wild. Also, SeaWorld officials suggested that SeaWorld would ship its killer whales to marine parks outside California before the bill became effective and probably sue the state." The vote on the bill will be delayed at least one year.